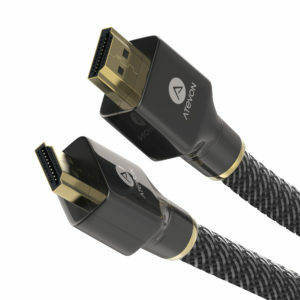 产品 – Home | Atevon Inc.
· MULTI-FUNCTIONAL SUPPORT – Atevon HDMI A Male to A Male Cable (4K @ 60Hz, 18 Gbps) supports 3D, HDCP 2.2, Ethernet, Audio Return(ARC), Dolby True HD 7.1 audio and Hot plugging. · UNIVERSAL COMPATIBILITY – Easily connects your CD/DVD/Blu-ray players, Fire TV, Apple TV, Roku streaming media player, PS3/4, Xbox One/360, computers, or other HDMI-enabled devices to your 4K/HD TV, monitors, or projectors. · SUPERB VIDEO QUALITY – Pure copper with 24K gold-plated connectors, high purity oxygen-free copper wiring and triple shielding ensure stable transmission and reduces more signal loss, so that this 4K HDMI cable not only can provide truer sound and picture, but also quality maintain the integrity and purity of the digital signal. · ULTRA DURABILITY – Designed and built with only premium materials ( Zinc-Alloy Shell, durable PVC, high quality nylon fiber cloth jacket), which means this HDMI Cord can withstand at least 10,000 cycles of 90 degrees bend tests and hold up to 10kg. · Lifetime Warranty – Atevon Unconditional Lifetime Warranty protects your significant investment. Please contact us with any question or concern – we are here to help.